Henschel was one of four companies (the others being Focke-Wulf, Gotha and Hamburger Flugzeugbau) to which, in April 1937, the Technische Amt of the Reichsluftfahrtministerium (RLM) issued a specification for a twin-engine ground-attack aircraft. It was required to carry at least two 20 mm MG FP cannon and to have extensive armour plating protection for crew and engines. The two designs for which development contracts were awarded on 1 October 1937 were the Focke-Wulf Fw 189C and Henschel Hs 129. The Hs129 was another Friedrich Nicolaus design with a light alloy stressed-skin fuselage of triangular section. It was designed around a single large "bathtub" of steel sheeting that made up the entire nose area of the plane, completely enclosing the pilot up to head level. Even the canopy was steel, with only tiny windows on the side to see out of and two angled blocks of glass for the windscreen. It contained a small cockpit with a restricted view, necessitating the removal of some instruments to the inboard sides of the engine cowlings. The windscreen was made of 75 mm (2.95 in) armoured glass and the nose section was manufactured from armour plating. Nose armament comprised two 20 mm MG FF cannon and two 7.92 mm (0.31 in) MG 17 machine guns. In order to improve the armor's ability to stop bullets the sides were angled in forming a triangular fuselage, resulting in almost no room to move at shoulder level. The Revi C 12/C gunsight was mounted outside on the nose. The prototype flew in the spring of 1939, powered by two 465 hp (347 kW) Argus As 410A-1 engines, and two further prototypes were flown competitively against the modified Fw 189 development aircraft for the Fw 189C. The entire nose section formed a welded armoured shell 6 mm to 12 mm thick around the pilot, with toughened 75 mm thick glass in the canopy. The total weight of the nose armour was 2,380 lbs (1080 kg). In the end the plane came in 12% overweight and the engines 8% underpowered, and the controls proved to be almost inoperable as speed increased. The Fw design proved to be no better, both planes were underpowered with their Argus 410 engines, and very difficult to fly. In the end the only real deciding factor was that the Henschel was smaller and cheaper. The Focke-Wulf was put on low priority as a backup, and testing continued with the Hs 129A-0. The company was awarded a contract for eight pre-production Hs 129A-0 aircraft, and these were issued initially to 5 (Schlacht)./LG 2 in 1940, but transferred to 4./SG 101 at Paris-Orly in 1941, with the exception of two which were converted at Schonefeld to accept Gnome-Rhone 14M 4/5 radial engines. It was with this powerplant that 10 Hs 129B-0 development aircraft were delivered from December 1941; improvements included a revised cockpit canopy and the introduction of electrically-actuated trim tabs. Armament comprised two 20 mm MG 151/20 cannon and two 7.92 mm (0.31 in) MG 17 machine guns, along with the ability to carry four 50kg bombs under the midline. But even before the A-1's were delivered the plane was redesigned with the Gnome-Rhone 14M radial engine, which were captured in some number when France fell. This engine supplied 700 hp (522 kW) for takeoff compared to the Argus at 465 hp (347 kW). The A-1 planes were converted into Hs 129B-0's for testing (although some claim that some A's were sold to Romania) and the pilots were reportedly much happier. Their main complaint was the view from the canopy, so a single larger windscreen and a new canopy with much better vision were added, resulting in the production model Hs 129B-1. The first flight of the Hs 129B was in October 1941. B-1's started rolling off the lines in December 1941, but they were delivered at a trickle. In preparation for the new plane, I./Sch.G 1 had been formed up in January with 109's and Hs 123's, and they were delivered B-0's and every B-1 that was completed. Still, it wasn't until April that 12 B-1's were delivered and its 4th staffeln was ready for action. They moved to the eastern front in the middle of May, and in June they received a new weapon, the 30 mm MK 101 cannon with armor-piercing ammo in a midline pod. The production Hs 192B-1 series became operational on the Eastern front, where the type was to be used most widely, although it served also in North North Africa, Italy and in France after the D-Day landings. Sub-variants of the M 129B-1 series included the Hs 129B-1/R1 with additional offensive armament in the form of two 110 lbs (50 kg) bombs or 96 anti-personnel bombs. The Hs 129B-1/R2 with a 30-mm MK 101 cannon beneath the fuselage. The Hs 129B-1/R3 with four extra MG 17 machine-guns; the Hs 129B-1/R4 with an ability to carry one 551 lbs (250 kg) bomb instead of the Hs 129B-1/R1's bomb load; and the Hs 129B-1/R5 which incorporated an Rb 50/30 camera installation for reconnaissance duties. By May of 1942 only 50 of the planes had been delivered when they started to deliver the new Hs 129B-2 model side-by-side with the B-1. The only difference between the two were changes to the fuel system – a host of other minor changes could be found almost at random on either model. As time went on these changes were accumulated into the B-2 production line until you could finally tell them apart at a glance, the main differences being the removal of the mast for the radio antenna, the addition of a direction-finding radio antenna loop, and shorter exhaust stacks on the engines. In the field the differences seemed to be more pronounced. The R-kits were renumbered and some were dropped, and in general the B-2 planes received the upgraded cannon pack using a MK 103 instead of the earlier MK 101. These guns both fired the same ammunition, but the 103 did so about almost twice the rate. The Hs 129B-2 series which was introduced into service in the early part of 1943. They included the Hs 129B-2/Rl which carried two 20 mm MG 151/20 cannon and two 13 mm (0.51 in) machine-guns; the generally similar Hs 129B-2/R2 introduced an additional 30 mm MK 103 cannon beneath the fuselage; the Hs 129B-2/R3 had the two MG 13s deleted but was equipped with a 37 mm BK 3,7 gun; and the Hs 129B-2/R4 carried a 75 mm (2.95 in) PaK 40L ('L' for Luftwaffe) gun in an underfuselage pod. Final production variant was the Hs 129B-3 of which approximately 25 were built and which, developed from the Hs 129B-2/R4, substituted an electro-pneumatically operated 75 mm BK 7,5 gun for the PaK 40 (Panzer Abwehr Kanone 40). The lethal capability of the Hs 129B-2/R2 was amply demonstrated in the summer of 1943 during Operation 'Citadel', the German offensive which was intended to regain for them the initiative on the Eastern Front after the defeat at Stalingrad. During this operation some 37,421 sorties were flown, at the end of which the Luftwaffe claimed the destruction of 1,100 tanks. 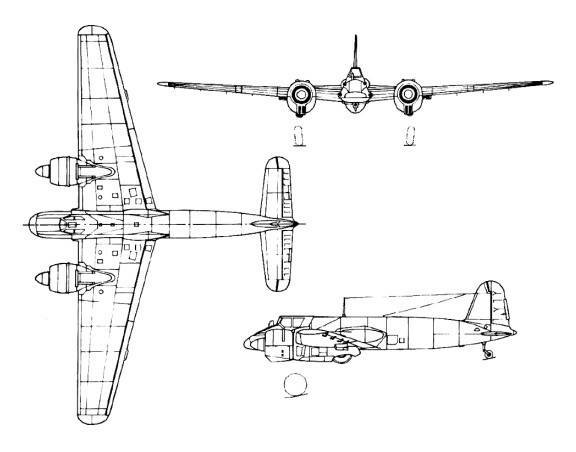 However accurate these figures, not all of those destroyed could be credited to Hs 129s, but there is little doubt that the 879 of these aircraft that were built (including prototypes) played a significant role on the Eastern front. Inspite of its small numbers and deficiancies, proved extremely successful in the anti-role, however, it suffered heavy losses and not many examples survived the war. Even by late 1942 complaints started about the MK103 against newer versions of the Soviet T-34 tanks. One solution would be to standardize on the larger 37 mm gun, itself adapted from an anti-tank gun that had recently been abandoned by the army. For some reason the Luftwaffe decided to skip over this gun (although it served perfectly well on the Ju 87), and install a gigantic 75 mm gun from the Panzer IV. A huge hydraulic system was used to damp the recoil of the gun, and an auto-loader system with twelve rounds was fitted in the large empty space behind the cockpit. The resulting system was able to knock out any tank in the world, but the weight slowed the already poor performance of the plane to barely flyable in this new Hs 129B-3 version. B-3's only started arriving in June 1944, and only 25 were delivered by the time the lines were shut down in September. A small number were also converted from older B-2 models. In the field they proved deadly weapons, but with only 25 of them they had no effect on the war effort. In order to address the poor performance of the aircraft, plans had been underway for some time to fit the plane with newer versions of the Italian Isotta-Fraschini Delta engine that delivered 850 hp (634 kW). However the engine ran into a number of delays, and was still not ready for production when the plant was overrun by the Allies. The Hs 129B-1 and B-2 were the major production variants, the latter fitted to carry a drop-tank. Some were equipped experimentally with the SG 113A recoilless gun installation: a battery of six 75mm smooth-bore tubes, each 1.6m long, mounted in the fuselage at an angle slightly beyond the vertical to fire downwards and rearwards. The weapon was intended for use against tanks and was triggered automatically when the aircraft flew over a tank at low altitude. A total of more than 800 Hs 129 were built. Initial climb rate: 1,600 ft (486 m) per minute. Range: 348 miles (560 km) on internal fuel. Armament: Two 20 mm MG 151/20 cannon with 125 rounds per gun and two 7.92 mm (0.31 in) MG 17 machine guns with 500 rounds per gun. Range: 427 miles (688 km) on internal fuel. Armament: Two 20 mm MG 151/20 cannon with 125 rounds per gun and two 13 mm (0.51 in) MG 131 machine-guns with 250 rounds per gun (retained the 7.92 mm (0.31 in) MG 17 machine guns).